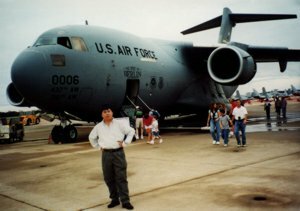 Some observations and opinions about transportation in the United States, Europe and China are presented. A fully automatic, high speed, high capacity personal transportation system must be developed for the dispersed, distant and complex transportation needs of modern cities around the world. Transportation is vital to the social and economic development of civilizations. For a long time in history, horse-pulled wagons on the roads and boats on rivers and seas were the main transportation means. 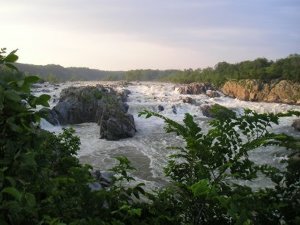 After the independence of the United States, the first major engineering project was to make the Potomac River navigable. Walking along the remains of the canal at Great Falls, one can see the advancement in transportation technologies of this country, from ships, to railways, to highways and air flights. 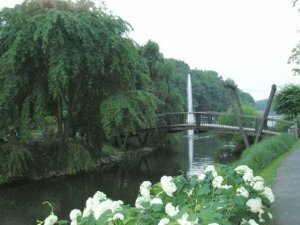 In comparison, the same people who had planned the Potomac River Project had also drafted the Constitution, which has survived all the technological and social changes in more than 200 years. Today automobile is the dominant means for passenger transportation in the United States. Most people drive to work alone, and public transportations including buses, subway, and taxi, account for only 4.7% of commuting transportation. The convenience of automobile transportation contributes significantly to the vitality of US economy, but automobile has its side effects: traffic congestion, air pollution, traffic accidents, and energy shortage. 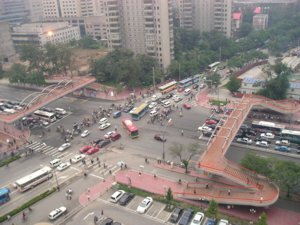 An economically viable modern city has a complex multi-component economic structure, which leads to a dispersed, distant and complex traffic. The starting point of urban transportation is to develop a transportation system according to the requirements of the economic structure. Any attempts to force an outdated transportation system will result in both an unpleasant commuting experience and an inefficient economy. The US highway system has an enormous impact on the economy, just like the railway system in the 19th century. Whether you are on the east coast or in the midwest, perhaps you get some of your vegetable from California. The highway system makes the railway passenger service unattractive. The government efforts to save the railway passenger service have been proven costly and futile. However, the railway is ideally suited to high volume cargo transportation and it is very competitive in high volume cargo transportation. The highway also makes the natural treasures more accessible to ordinary people. Sometimes, highway transportation can be treacherous due to bad weather conditions, such as snow, storm, strong wind, fog, and sand storms and falling rocks in some areas. On my way back from a trip to Morgantown, West Virginia, I nearly got killed as I ran into a patch of fog on Interstate 68 in the Mountain area. 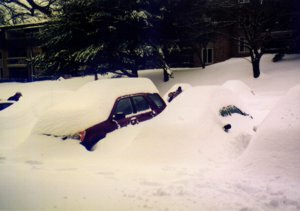 Digging out is a task for many people in the northern part of United States. 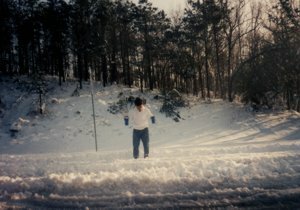 Snow removing can be costly and time-consuming. Sometimes, it takes several days for the streets to be ready for traffic. Some natural conditions can be challenges to road building. Expensive bridges need to be built across rivers. 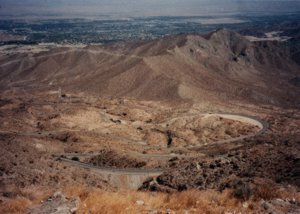 In mountain areas road construction can also be very expensive. Energy consumption and air pollution are also problems with automobiles. A typical car has a gas mileage of 25 miles/gallon with a power rating around 100-200 hp. The over-dependence on oil has been a source of international conflicts over energy security. 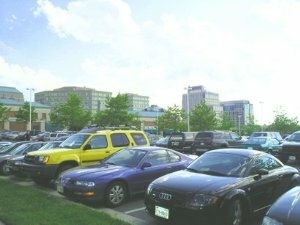 Parking can be problematic in downtown business areas. It may be difficult to find a parking space. It may require a long walk from the parking lot to the desired destination. 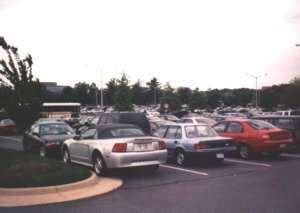 A shopping center also needs plenty of parking space. Some estimation puts the pavement area in the United State at about 2% of the total land area, or about 10% of its arable land. If we live together and work at the same place, all existing transportation methods can solve the commuting problem well. Bus will be the most cost-effective method. 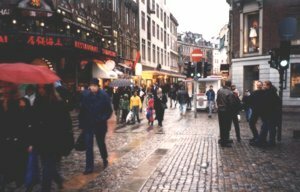 Given the dispersed living and working conditions of a modern city, automobile is the most efficient existing transportation tool below its capacity limit. When the population density is above a certain limit of road capacity, the problem becomes complicated. The answer of conventional wisdom is public mass transit system. The answer of conventional wisdom is very reasonable. 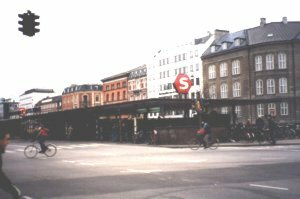 Let us look at Copenhagen, a city with a well-developed public mass transit system. Subway and buses are well-connected and coordinated, and bicycles are used extensively as a feeding mechanism for the mass transit system. The same ticket can be used for both subway and buses. The subway and buses are easily accessible to wheelchairs and baby carts. Basically, you can easily go to any places with a combination of subway, buses, biking and walking. The public transit system of Copenhagen is indeed very impressive. However, there are several shortcomings. Suppose you live somewhere south in the city and want to go to Denmark Technical University in the north. It would take 1-2 hrs by a combination of subway, bus and walking, but it takes only 30-40 minutes by car. So my cost-concerned boss told me to use public transit, and my efficiency-concerned boss told me to use taxi. When commuting distance is limited, job opportunities and business activities are also limited. As for comfort and convenience, the public mass transit is no match for automobile. During the time period not for normal commuting, the public mass transit system seems nonexistent and the only way to go around town is by taxi. How about grocery shopping? It would be difficult without a car. A salient characteristic of mass transit is the requirement for feeding mechanisms. 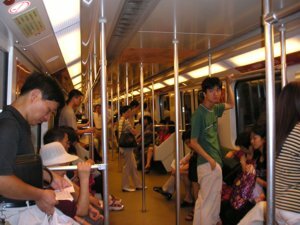 Typically, buses, cars and bicycles are used as feeding mechanism for subway. Cars and bicycles are feeding mechanism for buses. To maintain a meaningful speed, stations must be some distance apart, typically around 1 miles or 2 km. Therefore, considerable walking is involved. Considerable delays and congestions are related to connections and transfers. Existing public mass transit systems can increase the traffic capacity in the existence of traffic congestions, but at a cost of convenience, comfort and efficiency. Mass transit generally cannot remove traffic congestions. Automobile, though convenient, comfortable and efficient, has a limited capacity. Moreover, about 1/3 to 1/2 of the population cannot drive due to age, physical and mental conditions. Therefore, there is a need for a new automatic system with convenience, high speed and high capacity. The construction and operation of subway are very expensive. To recoup the construction and operation cost, the ticket for subway will be so expensive that very few passengers will use the subway. Generally, the construction cost is never recouped and significant government subsidies are necessary for the operation. 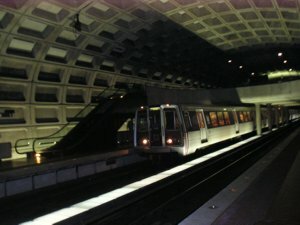 For example, the ticket sales of Washington Metro subway can only cover about 50% of the operation cost. It is the belief of many people that subway is symbolic of a modern city. This was true for the "modern city" in Chaplin's "modern time". In fact, most modern cities built in the 20th century do not have a subway system. 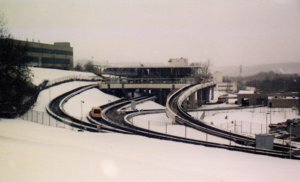 Subway, due to its exclusive guideway, is not affected by traffic congestion. For example, the traffic congestion in Beijing is so bad that automobile transportation during rush hour is unpredictable. It is safe to know that you can get some place on time by the subway, better slower than later. 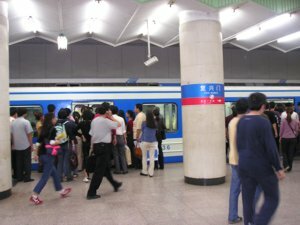 To further increase the capacity of subway in this populous city of Shanghai, only a few seats are available in the cars of subway. Standing for long commuting trips can be difficult in this large metropolitan area. On the surface, a high population density seems ideal for the use of subway. 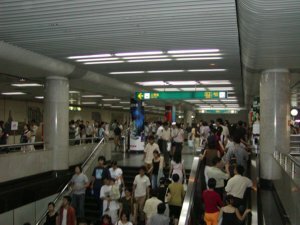 However, a high population density also creates serious congestions at subway stations, especially at connection stations. Subways are also easy targets for terrorist attacks, fires, poisonous gases, and contagious diseases. The bus is a very effective transportation system on some college towns. 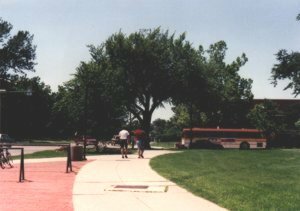 The bus routes connect high population density student dorms and apartments with the university campus. 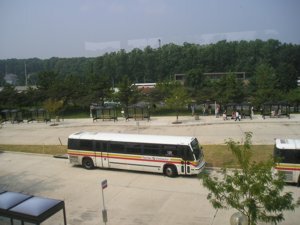 The mass transit system is effective because the collective living and working pattern unique to some college town. This was the case for many cities in the late 19th century, but it is no longer valid for most modern cities. Only for cities with unique elongated shapes, subway is somewhat cost-effective. Bikes, a popular transportation tool in 19th century, have mostly become an exercise equipment in the United States. 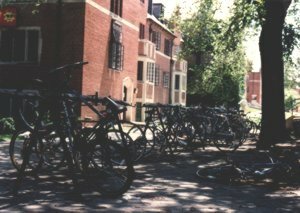 However, bikes can be very useful on a university campus. 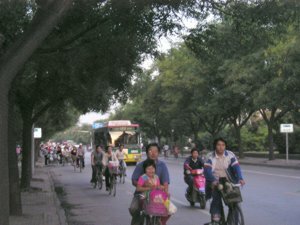 In developing countries like China, bikes are still used extensively for transportation. Generally, there are special bike lanes on the streets of cities in China. 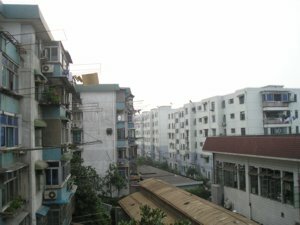 On the one hand, bikes are very convenient and affordable, indispensable for many urban residents in China. 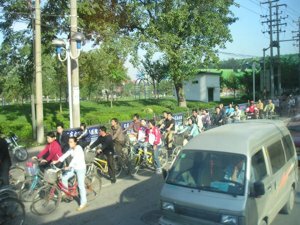 A mayor in a middle-sized city in China told me that you can never remove the bikes from the streets of China. On the other hand, bikes are a serious hurdle to automobile transportation. Bikes and cars simply cannot be mixed. 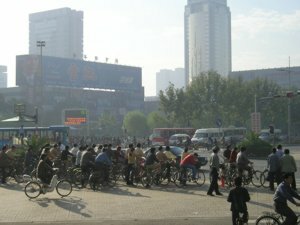 Take a look at the morning rush hour in ShijiaZhuang, the capital city of Hebei province, China. If we cannot solve the transportation needs of ordinary people in China, the cars of rich people cannot go faster. Bikes are very convenient and efficient for short distance transportation. 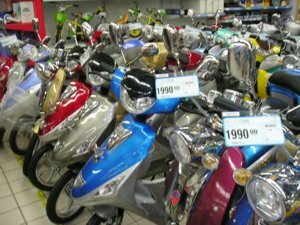 Now bikes powered by batteries are widely available in China's market, which make longer travel distance possible. With a power rating of 1/4 horsepower and a retail price about US$240, they are very inexpensive to ordinary urban residents. However, the widespread use of electric bikes will reduce the automobile speed and the automobile capacity of a city. There is a conflict of interests between the electric bike industry and the auto industry. 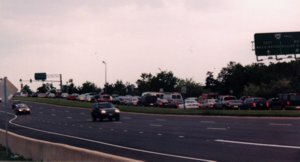 A look at the situations on the streets further illustrates the problem of mixed traffic. With easy credit for promoting car sales and the threat of SARS, there was a sudden increase in private car ownership in Beijing in 2003. Now with 2 million automotive vehicles on the streets, Beijing has a serious traffic congestion. 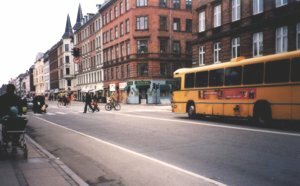 The current mindset to spend more on buses and subway will lead to a mixed traffic situation as shown in Denmark. The difference is that the Danish people intentionally want to limit the number of cars to protect the environment and in China they want to increase the car sales to boost the economy. Traffic congestion will be a major concern to the 2008 Olympic Games. It is obvious that existing transportation modes cannot adequately solve the traffic problems in developing countries like China. It will be more effective to develop new ideas than to push the envelope of old technologies for urban transportation solutions. 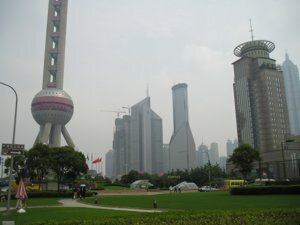 With the rapid economic growth in China, the traffic problem will become even more serious in China's modernization process. Notes: * Transportation costs vary considerably with the construction and operation conditions. These numbers are guess-estimates of typical commuting costs. ** Capacity for a normal highway lane or equivalent at comfortable conditions. Single occupancy for automobile. The lower number for subway corresponds to all seating and the higher number all standing. The lower number for bus corresponds to interval of 3 minutes and the higher number an exclusive bus lane. *** Cost should include fuel, road construction and maintenance, vehicle, and insurance. The cost of mass transit depends on the ridership. Here a ridership near the capacity for rush hours is assumed. In addition to the direct costs of transportation, the adjusted costs are also listed for developed countries (pay=$15/hr or annual salary of $30,000) and developing countries (pay=$1/hr or annual salary of $2,000) respectively. There are other factors for commuter's choice of transportation means, such as convenience, comfort, safety, and availability. It is a myth that subway can help reduce the traffic congestion. It is true that subway can increase the traffic capacity when there is already a serious traffic congestion. From the above cost data, traffic congestion is the condition for a significant rideship of subway. Only when the speed of automobile is significantly reduced can we have a comparable cost for both automobile and subway. 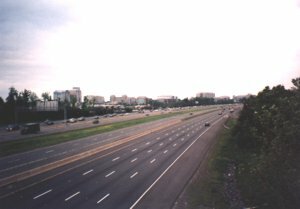 To reduce the traffic congestion, we can (1) significantly increase the cost of automobile travel by high gas and vehicle taxes, high tolls, high parking fees, etc, or (2) reorganize the residential and business distribution, or (3) develop a cost-effective new mode of personal transportation system. The first flight of Wright Brothers on December 17, 1903, carried the human race skyward. As Bill Gates put it, “Their example reminds us that genius doesn’t have a pedigree, and that you don’t discover new worlds by plying safe, conventional waters.” Today, air flight is the major means for long distance travel. This year marks the last commercial flight of supersonic jets. For every transportation tool there is a limit for its efficient operation. 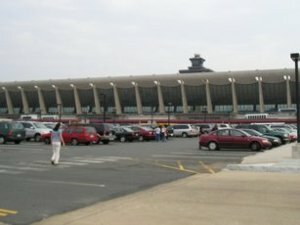 For air travel, we need more improvement in the transportation connections to the airport. 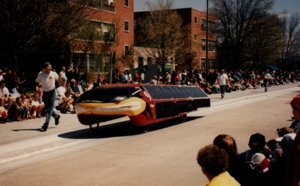 For commercial transportation at higher speeds, one proposal is through the outer space, and another proposal is through an evacuated tube (See website of et3.com). 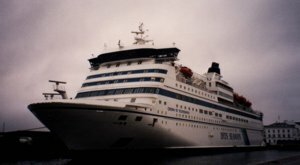 Although air flight has largely replaced ships for cross-ocean travel, the ship building industry has continued to grow in other areas. One direction is luxurious cruise ships, and another direction is container cargo ships. This is always the case for advancement in transportation technologies. The old technology always has two directions for further growth: a luxurious recreational market and an efficient niche market. Automatic transportation has been studied for at least 50 years. Soon after the United States sent the first man to the moon, President Nixon declared if we can sent a man to the moon we can send a man 3 miles across the town. It turned out that an efficient commuting solution is more difficult. 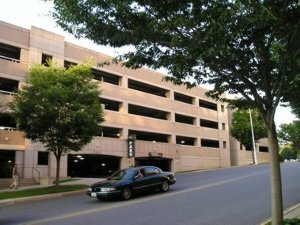 A demonstration project has been in continuous operation since 1975 at Morgantown, West Virginia. Automatic automobile transportation has also been successfully tested. These projects demonstrated the technical feasibility, but an economically feasible system remains to be developed. An important consideration for development of a new transportation system is its environmental impacts. 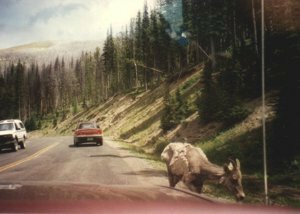 We need a people-friendly, environment-friendly and wildlife-friendly transportation system.